FILE - U.S. House Speaker Nancy Pelosi holds a news conference at the U.S. Capitol in Washington, Jan. 10, 2019. U.S. House Speaker Nancy Pelosi suggested Wednesday that unless a partial government shutdown is resolved this week, President Donald Trump should either delay his State of the Union address or consider delivering it in writing. Pelosi cited concerns about security preparations needed for the annual high-profile event before Congress, which is scheduled for Jan. 29. In a letter to Trump, she noted the U.S. Secret Service, which protects the president and his family, and the Department of Homeland Security have not been funded during the shutdown, “with critical departments hamstrung by furloughs.” Trump’s security detail has been working without pay since Dec. 22. Pelosi opposes Trump’s call for $5 billion in taxpayer funding for a wall at the U.S.-Mexico border. Trump says the wall is necessary to stop people from coming into the country illegally, and to stop the flow of illegal drugs. Pelosi and other Democratic leaders say a wall is an expensive and ineffective solution and instead say a smaller amount of funding should go toward other border security measures. 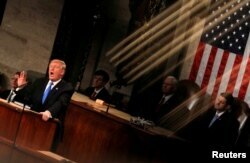 FILE - U.S. President Donald Trump is seen under the reflection of a House chamber railing as he delivers his State of the Union address to a joint session of the U.S. Congress on Capitol Hill in Washington, Jan. 30, 2018. Postponing the speech beyond the shutdown would deny the president a highly visible platform in which he could continue to pressure Democrats to meet his demand. Trump did not publicly comment on the move Wednesday. Democrats have countered that McConnell is the one obstructing work in Congress after the House of Representatives passed multiple spending bills that would end the shutdown and McConnell refused to bring them before the Senate. He has said he will not consider any bill that he thinks Trump would not support. “I mean, you actually have to try really hard to be in charge of the United States Senate during the longest shutdown in American history and do absolutely nothing to deal with it for 26 whole days,” Democratic Sen. Chris Murphy said. Trump on Wednesday signed a bill to guarantee that all affected federal workers will eventually be paid their lost wages, as has been done during previous shutdowns in the past several decades. Workers for private contract companies hired by the government, however, are unlikely to recoup lost wages. If the shutdown lasts another week, government workers will miss their second paycheck this month. But there was no immediate end in sight for the shutdown, the longest in American history. Federal air traffic controller union members protest the partial U.S. federal government shutdown at a rally at the U.S. Capitol in Washington, Jan. 10, 2019. On Tuesday, Kevin Hassett, the chairman of Trump’s Council of Economic Advisers, doubled the previous estimate of the cost of the shutdown, saying the country’s robust economy has already lost a half percentage point from the government closures, during which 800,000 government workers have been furloughed or forced to work without pay. 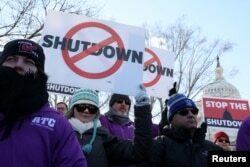 He said quarterly economic growth is being reduced by 0.13 of 1 percent each week the shutdown continues. The Senate and House are to be in recess next week, but leaders in both chambers have said that break will be canceled if the shutdown is still in effect.